Have you seen our cooking with kids A-Z posts? We're cooking our way through the alphabet along with a few other kids' activity bloggers. 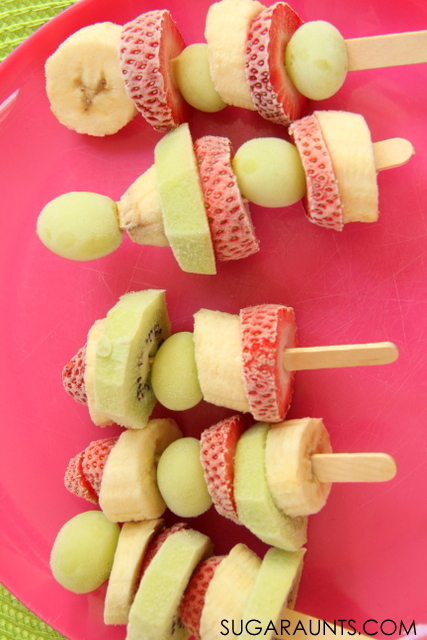 We're up to K for Kiwi and sharing our favorite summer recipe: Frozen Fruit Kabobs! 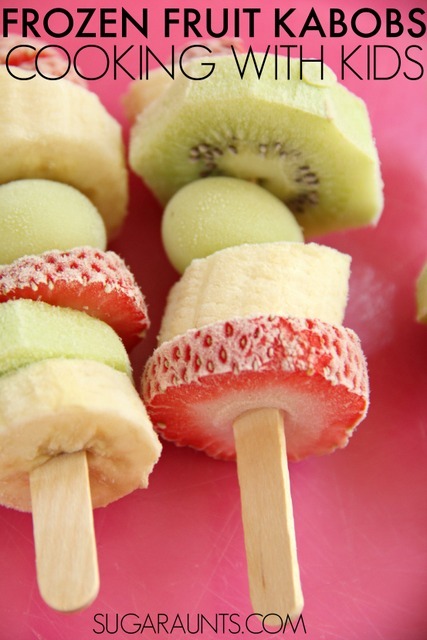 These are always a hit in our house, but especially during the hot summer months, the kids love these frozen fruity treats that are a healthy alternative to popsicles. This is definitely a recipe that younger kids can make. My preschooler was able to do most of the prep and all of the spearing on her own. The hardest part of this recipe is waiting for the fruit to freeze! 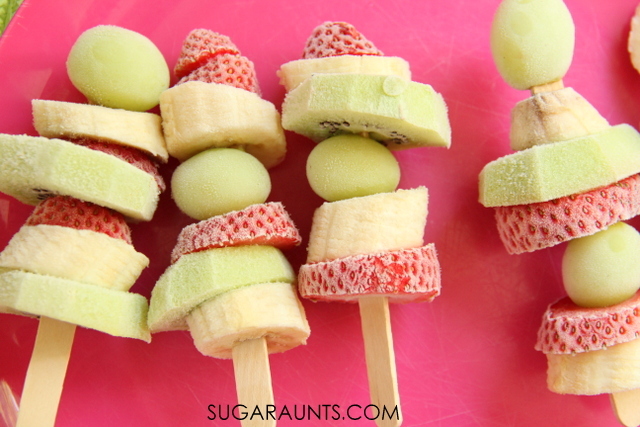 Summer Healthy Treat for Kids: Frozen Fruit Kabobs! 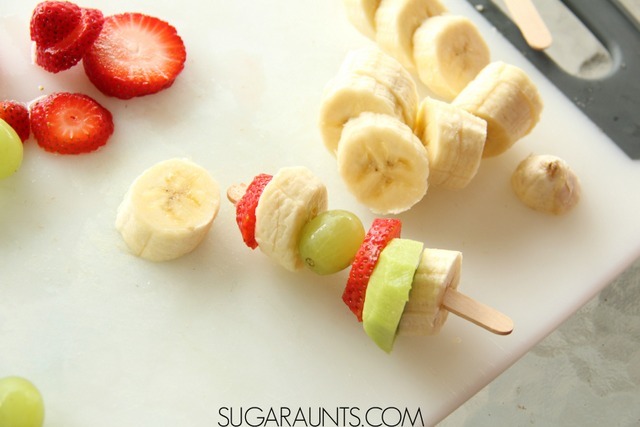 These fruit kabobs are beyond easy. Grab a handful of craft sticks and your favorite kid-friendly knife . 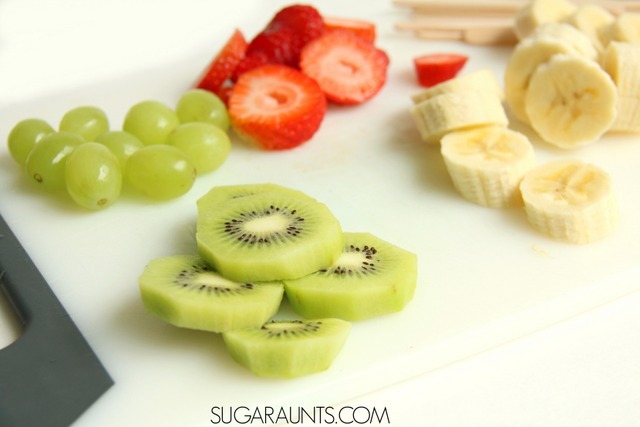 You'll want to use fresh fruit that your child loves, but also try a few new fruits. It's a great way to introduce something new. In our case, my older kids have had kiwi before--and my three year old has too, but could totally not recall ever eating it. Other fun new fruits to try may be star fruit, mango, or pineapple. Slice and wash the fruit. The kiwi are a little harder to peel and slice, but ours were not extremely soft. kabob skewers for a snack created for adult or teens, but because we were making a popsicle-like treat for kids, we went with the safer version. 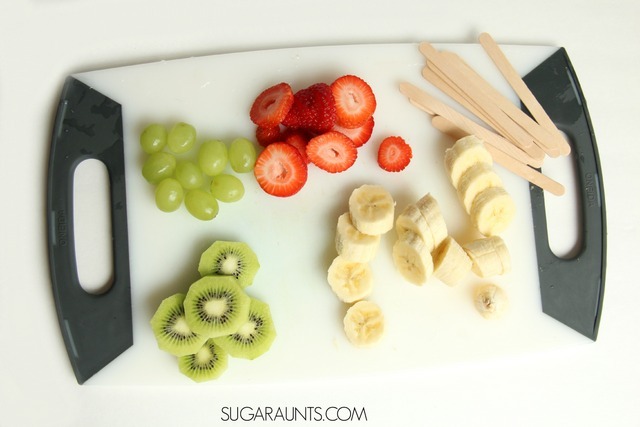 For easy skewering of the fruit with the craft sticks, we found that if we put the strawberry and kiwi slices flat on the cutting board and poked the craft stick down into each slice, they went on the stick much easier. 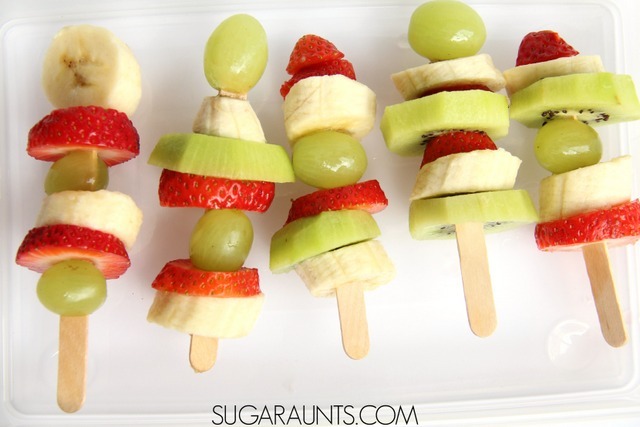 Have the kids arrange their fruit kabobs however they like. It was fun to hear each kids' take on their fruit kabobs. We had a rocketship and strawberry hats among our fruit kabobs. 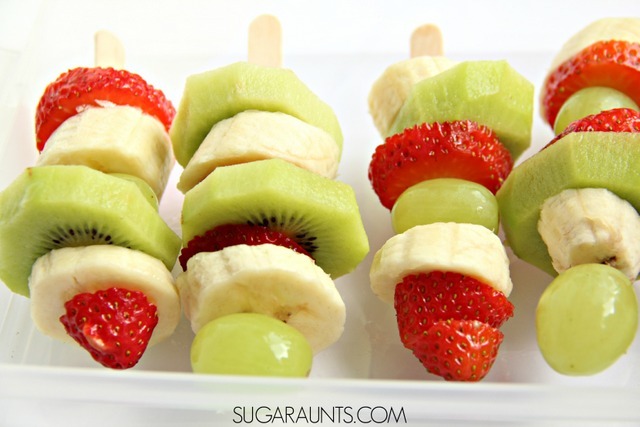 Place the fruit kabobs in a flat container. We used our snap and stack containers for a shallow kabob holder while in the freezer. Place the lid over the fruit and wait for them to freeze. Once they are frozen, enjoy! 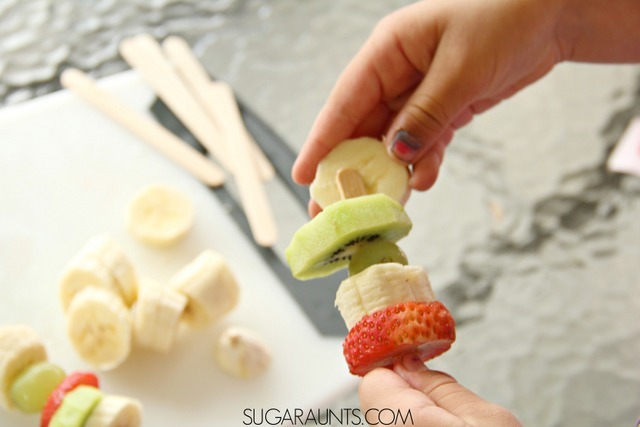 The kids will love the frozen fruit treats that they made and mom will love the healthy alternative to popsicles! 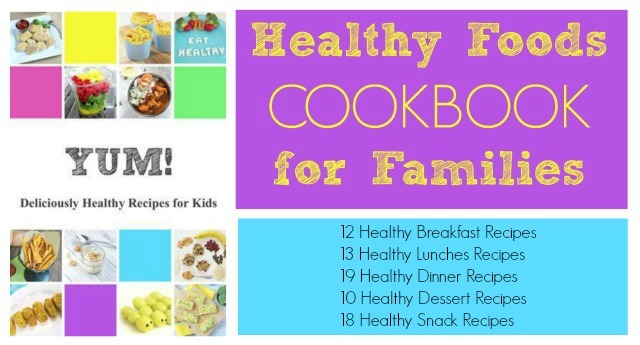 Stop by and see the rest of our cooking with kids A-Z posts!